Mystical events that seem to defy the laws of science have fascinated people in various places and times. Miracle healings, spiritual visitations, apparitions, icons and statues that weep, hands and feet that seem to bear the wounds of Christ, images of Christ or Our Lady appearing on various objects, oil and other substance oozing out of objects, are not only the grist for tabloid press but have also won a place in mainline belief. Any word of weeping statues, leaking paintings, miraculous appearances of images is bound to attract a whole spectrum of visitors, from believers, paranormal investigators, sceptics, to the tabloid media. Why this frenzied interest? It would seem that the need for images, or the need for “seeing” is fundamental. It is living proof that our faith is often not just an abstraction but rather a conclusion drawn from what is perceptible. Perhaps, more than anything else in these troubled times, sight of such phenomena reawakens faith and hope above all else. Each of us, deep down inside, wants to be thrilled by what Robert François calls “a theophany, a manifestation of God, a certain proof, before (we) believe in His existence.” At times we are more demanding than St. Thomas the Apostle himself, and we want to be continually touching the miraculous action of God in order to believe in it. But the difficulty lies in authenticating such phenomena. It is objectively real or just the figment of our imagination, the delusions of mental derangement or the product of a hoax? It’s very difficult to separate miracles from wishful thinking, reality from hallucinations, authentic mystical experiences from hoaxes. To the sceptical mind, such occurrences are part of the spectrum of religious fantasies that includes such idiocies as the US$28,000 sale on ebay of a 10-year-old grilled cheese sandwich with an “image” of Mary. The woman who sold the sandwich claimed that the image helped her to win $70,000 at the casino. There is no doubt that there is blessedness in seeing; and there is blessedness in believing; and there is blessedness in believing after seeing; but that of which the Lord here speaks is a blessedness different from these, and truer than all of them—the blessedness of believing without seeing. 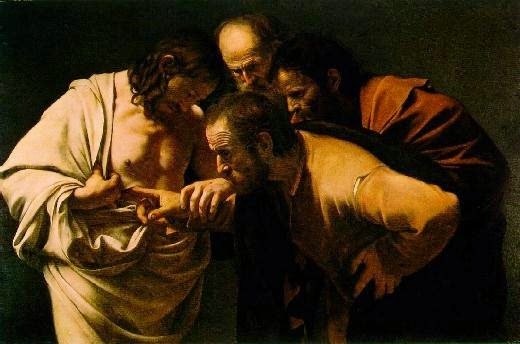 Thomas and the other apostles had the privilege of seeing and believing, and many would envy their advantage as firsthand witnesses; yet the Lord assures the rest of us who have “not seen” him in the flesh, that there is great blessedness in believing even when we are denied to opportunity to see. This blessedness flows from simple faith, in the absence of all visible or sensible helps; simple faith, that counts God's testimony sufficient, makes no demands of signs from him, though, in doing this, it is unassisted by eye, or ear, or hand. Just like St Thomas was called, we too are invited to move beyond the sensational aspects of the resurrection to a more mature faith in Jesus as ever present to his followers. We who live beyond the age of the first eyewitnesses of the wonder of the resurrection, and who have to contend with second hand accounts of this event, would find consolation in this story of St Thomas. As one who hesitated, questioned, and then moved from scepticism to a firmer, more committed faith, Thomas is a source of encouragement for all of us, who often struggle with issues of faith especially in the face of an apparently invisible and intangible God.